Phonologically prominent or "strong" positions are well known for their ability to resist positional neutralization processes such as vowel reduction or place assimilation. However, there are also cases of neutralization that affect only strong positions, as when stressed syllables must be heavy, default stress is inserted into roots, or word-initial onsets must be low in sonority. 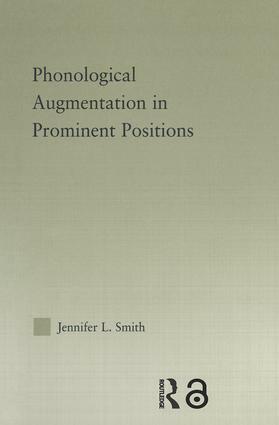 In this book, Jennifer Smith shows that phonological processes specific to strong positions are distinct from those involved in classic positional neutralization effects because they always serve to augment the strong position with a perceptually salient characteristic. Formally, positional augmentation effects are modeled by means of markedness constraints relativized to strong positions. Because positional augmentation constraints are subject to certain substantive restrictions, as seen in their connection to perceptual salience, this study has implications for the relationship between functional grounding and phonological theory.